We are pleased to announce that starting January 2008 we will be opening our first "Mission Design Competition". 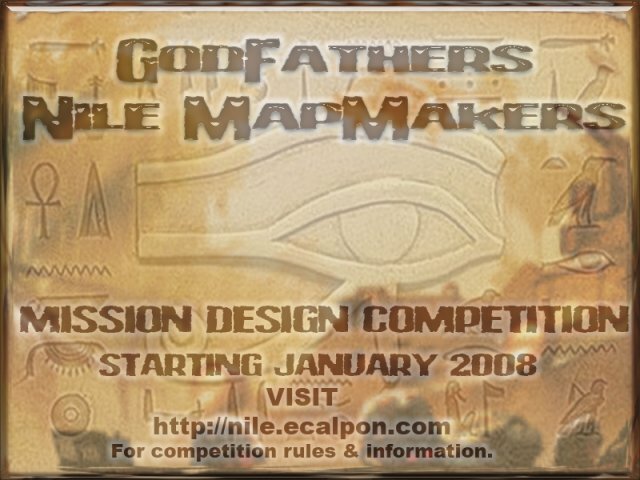 Open to all members of Godfather's Nile Mapmakers Forums, designed to allow beginner through advanced mapmakers an equal opportunity to to enter. The link requires a registration. Before signing up could you post some details on the competition? Open to Delta Force and JO games. Maps submitted by Date X. Enter as many maps as desired. At the beginning of the Competition, you will be presented with a "Mission Briefing" and "Story Line". It will then be up to you to interpret this information and build a working mission to fit. As the mapmaker it will be up to you, what terrain, objects and even MOD are used to present your work. "Open to ALL APPROVED Nova Mods" Mapmakers may work as individuals or in teams to design the mission. Each Competition must be completed within two calendar months from the date of the "Briefing" and "Story" post. This will not mean you can not submit your entry earlier, but NO entries will be accepted after the cutoff date. Beginning and Ending dates will be posted in the Calendar system. You may not submit more than (1) ONE entry per person. So if you are working on a team, you may not submit another entry as an individual as well. All entries MUST be uploaded into our map library, and may not be posted elsewhere prior to completion of the Competition. "Once the current Competition is completed you are free to post your map anyplace you wish on the Internet." Entries may be updated to correct problems or add features prior to the end of Competition. Missions will be looked at for completeness, "Do things work, will the mission end, Etc." as well as object use and placement, "Are things floating in the air, or glitching, Etc." Then we will be looking for overall game play and that all important Enjoyment Factor "Was the mission fun to play" Last but not least, how close to the mission briefing and story-line is the was the mission designed? Who will be judging your mission? well the short version is to say "the members here". During the time a Competition is underway, we shall be hosting weekly members only server(s). These servers will host your entry as well as other work from our members, thereby giving our fellow members a chance to meet each other, have a bit of gaming fun and at the same time give feedback on your entries. The best entry from each MOD will be judged as winners, so there will likely be more than one winner "we hope!" As the site is free and no entry fee will be charged, no cash prizes will be awarded. Winning entries will be released as a "Mission Pack" at the completion of the Competition, thereby making different versions of the same mission available to players, thereby gaining the thanks and admiration of players around the world. Entries limited to NILE MISSION EDITOR ONLY. May I ask why it's NILE only? Well as that's what the site is all about, Nile Mapmakers it seems reasonable that thats what we conduct the competition on. Can you detect which editor has been used...? I suggest you change the name of the competition to Nile Mapmaking competition. I have to agree with the guys....I like the rules and such...but you need to explain a bit more for the folks who want to get in it. Not sure I understand, what did I miss in the instructions and rules? What do you guys want...? Giant letters stamped on your forehead !! The link doesn't require registration, I'm a member Yes, but I'm not logged in, and I can see the thread.. Yes Q-dad~TAG, they use different file names..
nothing wrong with the rules but i believe the title of the thread should be "Nile Mapmaking competition" just so people like myself who doesnt even have nile installed doesnt bother waisting time looking into it. I thought that "Godfather's Nile Mapmakers" said that, so didn't see any reason to repeat it. "Mapmaking Competition Ecalpon 12 86 "
no mention of nile there, and thats what i was talking about. no big deal though. just makes it easier for people to know what the subject is about and not a general mapmaking comp.